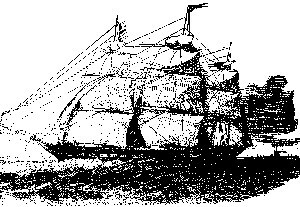 Launched on Tuesday 4th October, 1853 and watched by thousands, the Tayleur, an iron hulled clipper of the White Star Line, sailed from Liverpool on Thursday 19th January 1854 bound for Melbourne, Australia carrying 579 passengers and a full cargo. On the way down river the pilot noticed variations in the compass readings. From here on things began to go wrong, the weather became treacherous and the ship became difficult to control. To all on board the ship was heading south down the channel. In fact the Tayleur was heading due west towards the Irish Coast. On January 21st the wind shifted to a sudden squall from the south east, the look-outs cried out "Land Ho", the crew acted quickly but to no avail. Then came the deadly cry "breaker ahead" as the ship headed towards the rocks of Lambay Island. The Tayleur was doomed. As the vessel slipped into deep waters to its final resting place, exhausted survivors had to climb the vertical cliffs to seek help and shelter. Throughout Saturday night the gale continued to tear across the island, nevertheless on Sunday morning a boat was launched and reached mainland Rush with the crew of the wreck. Sir Roger Palmer hired a fishing smack, and with a volunteer crew crossed to Lambay with meat, bread, milk and whiskey. On Monday the 'Prince' under Capt Dearl took 230 survivors on board and proceeded to Dublin Capt Noble and twenty-five of his crew remained on the island for salvage purposes. Ninety souls were buried on the island, others in Malahide, more in their homeland and for some the sea remained their final resting place. For over a hundred years the Tayleur remained undisturbed, until 1957 when members of the Irish Sub-Aqua club located the wreck. The bell is now in the Maritime Museum in Dun-Laoghaire and an Anchor is on display at The Square, Rush. It has been accepted that history repeats itself, but the coincidences in the tragedy of the Tayleur and that of the Titanic are incredible. Both had sealed compartments that were supposed to make The Titanic 'Unsinkable' and The Tayleur 'The Safest Ship Built'. Yet in 1854 The Tayleur sank with the losss of 297 lives and in 1912 The titanic sank with the loss of 1523 lives. Both vessels were on their maiden voyages, registered in Liverpool and owned by The White Star Line. To this day Loughshinny fishermen report that lobster found around the site of the ship wreck are red in colour from the rusting iron hull wreck of the ship.